On May 18th, the Archaeology Section of the State Museum of Pennsylvania began assisting Cedar Cliff High School with a three week simulated archaeological project. As part of Mr. Daniel Reilly’s AP World History class, a number of students are spending part of their day learning about and doing archaeology at a mock excavation near the school’s sports stadium. For these students the program imparts a multi-disciplinary learning experience they will be able to apply to other classes in science and mathematics. A simulated archaeological excavation can be defined as an experimental project organized by a classroom teacher that has an educational goal of reconstructing human behavior using archaeological techniques (Chiarulli et al. 2000). Although students can learn about archaeology and archaeological methods in a classroom setting, there is nothing like a hands-on experience through a simulated excavation. Mr. Reilly (assisted by several other teachers who were intrigued with the project) created a multi-component site; that is, one dating to both historic Euroamerican times and one dating to a Native American occupation prior to the arrival of the Europeans, by burying artifacts in the ground. The artifacts representing the Native American camp site included a fire-cracked-rock hearth or oven with charcoal and food remains situated next to a pile of flakes from the production of stone tools (debris created by an actual flint knapping demonstration). In the corner of the site, three burials were placed; not actual human remains, but deer skeletons aligned in a human-like fashion – thus creating the “deer people”! The Euroamerican site was comprised of a brick fireplace with charcoal, broken dishes and food remains. Mr. Reilly registered the site with the Pennsylvania Archaeological Site Survey and was assigned the number 36CU0210. In preparation of fieldwork, the students were taught the difference between archaeology and paleontology; that archaeology is a subfield of anthropology – the study of human cultures; the nature and significance of stratigraphy; and the importance of archaeological context or the location of the site and the three dimensional location of the artifacts within it. Mr. Reilly holds a Masters degree in Archaeology from Queen’s University of Belfast in Northern Ireland where he has excavated Bronze Age, Iron Age, and Medieval sites. He also spent four years conducting compliance archaeology in the Middle Atlantic region before becoming a teacher. Working with limited resources, Mr. Reily was provided with basic field equipment (shovels, buckets, tapes and screens) from The State Museum of Pennsylvania, Section of Archaeology. The students conducted a controlled surface collection across the site, and placed flags where artifacts were found. This was followed laying out the excavation grid and a lesson on the Topcon total station (a laser based electronic transit and data recorder) from State Museum staff. Archaeology stresses precise mapping in order to identify patterns in artifact distribution. Based on the results of the controlled surface collection, the students broke into teams and selected a one meter unit for excavation. Using the principles of the Pythagorean Theorem (A squared + B squared = C squared), they placed stakes at the corner of their squares, connected them with string and started excavating. The plowzone was removed with shovels and the soil screened through a ¼ inch mesh. The students were taught that the context of artifacts in the plowzone had been compromised, and as a consequence, were not mapped with the same precision as those found at deeper, undisturbed soil layers. Once the subsoil was uncovered they began to dig more carefully with trowels. Each team was responsible for taking detailed field notes to document the location of features and the artifacts found in them. In the lab, the artifacts will be examined and a report developed that documents the methods and the findings. The students enjoy finding “stuff”, but they will also enjoy weaving the story of how the artifacts ended up at the site. Each student’s excavation report will include a review of excavation methodology, an analysis of recovered artifacts, conclusions drawn about each “culture” based on that analysis, and a recommendation for further work at 36CU0210. Archaeology is a multidisciplinary study encompassing aspects of geology, biology, mathematics, history and anthropology. Simulated archaeological projects can be a learning and entertaining experience for the students where they use archaeological data in a holistic approach to develop critical thinking skills with an emphasis on behavior rather than artifacts. Participation in this project and other outreach programs provides an opportunity for staff at the State Museum to educate the public in understanding archaeological methods, and clarifies some misconceptions about how archaeology is conducted. In summary, an archaeological field experience for high school students such as this allows teachers to answer the age old question often asked by students – “Why do we have to know this stuff?” This project helps students how other disciplines tie into creating the ‘big picture’ and allows them to understand why all learning is important. Hello my name is Tamara Eichelberger, and I was an intern during the spring semester with the Section of Archaeology at the State Museum of Pennsylvania. I have been interested in anthropology since I was a kid after I picked up a copy of National Geographic. I decided that I wanted to pursue a career in anthropology in high school and became a Sociology-Anthropology major at Elizabethtown College. While at Elizabethtown, I participated in archaeological digs at the Washington Boro site in Lancaster County and also in Trim, Ireland. I also worked for two weeks at the Museum of Copenhagen helping to wash, catalog, and analyze a collection of human skeletal remains. I got to spend my final spring semester of my senior year at The State Museum of Pennsylvania, and it was such a wonderful experience for me. Recording catalog information in preparation for analysis. While I spent some time organizing some documents donated to the museum at the beginning of my internship, the majority of my time was spent working with the collection of Native American axes housed at the museum. There are over 700 axes in the collection which were donated by private individuals in the early years of collecting. These collections were not cataloged and organized to today’s standards and had never undergone a comprehensive analysis. It was my job to go through over 50 boxes and make sure each axe had a unique catalog number and to measure and analyze the different features of the axes. The ultimate aim of the project is not only to catalog and measure the axes so the Museum has a record of them, but to also to do research on these axes. There have been few studies done on Native American axes in Pennsylvania so this project will add to our knowledge of stone tools in the area. Tray of axes which illustrates the variety of axes analyzed. Before coming to the Section of Archaeology, I did not have much experience with stone tools or curation in general. I worked closely with Dr. Kurt Carr and several of the other staff throughout my time at the museum. I learned about the cataloging process for the State Museum and was able to wash and label over 250 previously un-cataloged axes. After washing and labeling, we worked to create an Access data base so we could record the different features and measurements of the axes. This was the most difficult part of the process as time and time again we came across an axe that stumped us and forced us to add in new variables to the analysis. I learned a lot about the manufacture of the axes and the variety of different uses they could have had. There was so much variety in the different axes that it felt almost impossible at times to fit them all in to the data base. However, this catalog will help us to learn more about the varieties of axes so I am excited about what we can learn once it is completed. Measuring and weighing each axe with electronic calipers. My favorite experience this semester was working in the Nature Lab in the State Museum. The Nature Lab is a place where different divisions of the museum can share the work they do with visitors to the museum. Three times during my internship, I packed up a cart full of scales, axes, diagrams, and other tools and set myself up in the Nature Lab. I was able to talk to many interested visitors about the axe project and what kind of work I was doing as an intern. For me, the most rewarding part of archaeology is being able to share findings and history with others, and the Nature Lab allowed me to do just that. 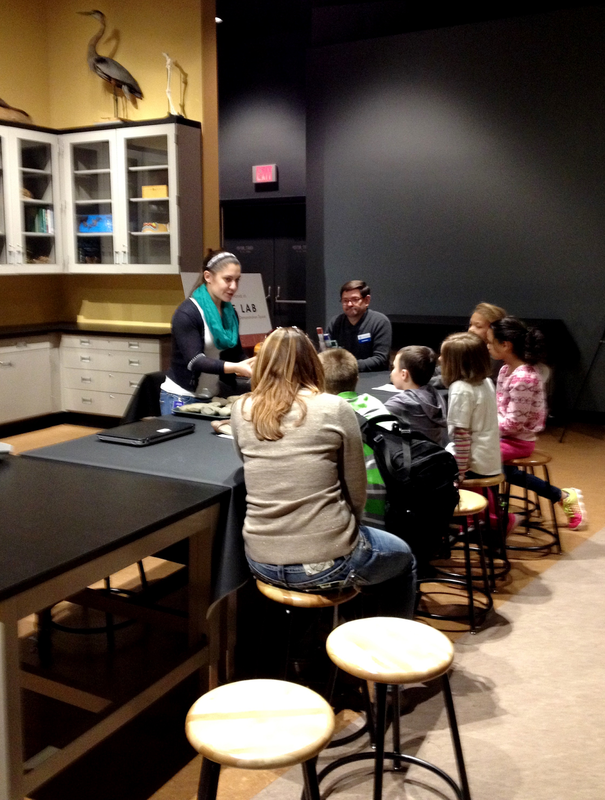 Many of the people who visited the Nature Lab were children who were on field trips to the Museum for the day. I loved to watch their eyes light up with amazement every time I told them that the axes I passed around to them were thousands of years old. They also asked many great questions about the axes, archaeology, and Native American culture. I can only hope that they will continue to be interested in learning more about the past in the future. Sharing my research in the Science Lab at The State Museum of Pennsylvania. I could not be more grateful for all of the help that everyone gave me at the Museum during the semester. After working with the Section of Archaeology, I realized that I could see myself working at a museum as a curator in the future. I gained so many valuable hands-on skills that will help me in the future as I head off to graduate school for bioarchaeology in the fall. Although my internship at the museum has ended, and I will be graduating from Elizabethtown College very soon, the axe project has not been fully completed. The next intern with the Section of Archaeology will pick up on the project where I left off. After spending a whole semester working with the axes, I want to continue to help with the project and hope to visit the Museum again in the summer as a volunteer.